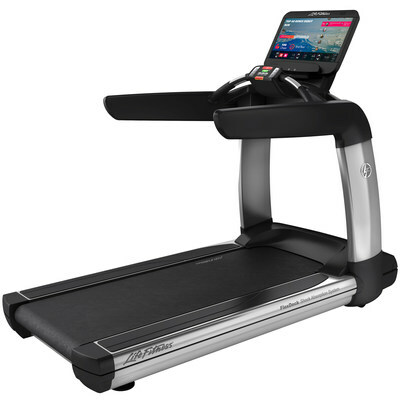 ROSEMONT, Ill., Feb. 8, 2018 /PRNewswire/ -- Life Fitness, the global leader in commercial fitness equipment, is adding competition, motivation and high-energy playlists to their treadmills outfitted with Discover SE3 HD consoles. Through their open architecture, Life Fitness has partnered with Studio, the leading audio group running platform, to offer treadmill users an energizing and challenging running experience. Runners will be able to experience the Studio platform on the 21-inch console screen, with or without a compatible wearable device. "We are proud to provide our content and incredible instructors to Life Fitness treadmill runners," said Jason Baptiste, founder and CEO of Studio. "We believe the way to make fitness more accessible is by using technology to make fitness entertaining. Our partnership with Life Fitness and their open architecture lets us scale that mission worldwide." Studio offers the popularity of group fitness with the flexibility of taking a class at any time. At the cornerstone of Studio is the asynchronous leaderboard, allowing runners to compete in distance and biometric data with anyone who has taken the class before. Classes are paired with an elite instructor and a music playlist that guide and motivate runners to reach new personal fitness goals. "We have assembled a team of the best top tier boutique fitness studio instructors from around the country," says Lisa Niren, director of content and programming, and head instructor at Studio. "World class content in the form of constantly varied workout types and musical themes, along with personalized motivation creates a euphoric experience that will inspire users to become better versions of themselves." Studio's platform will be available on Life Fitness treadmills with Discover SE3 HD consoles at select gyms in the U.S.
"Life Fitness knows that technology is central to helping people reach their fitness goals," says Jason Worthy, vice president of digital solutions and innovation at Life Fitness. "Our partnership with Studio creates an exciting digital experience far beyond what a traditional treadmill offers and will keep runners coming back to try new workouts, experience new instructors and beat their personal best." Life Fitness is the global leader in commercial fitness equipment. The company manufactures and sells its strength and cardiovascular equipment under the brand names Life Fitness, Hammer Strength, Cybex, Indoor Cycling Group and SCIFIT. Its equipment is distributed to more than 166 countries. Headquartered outside Chicago, in Rosemont, Ill., Life Fitness is a division of Brunswick Corporation (NYSE: BC). Studio's platform delivers audio group running classes that pair a motivating instructor with a killer playlist at anytime that's convenient to you. Compete in real-time on our leaderboard against runners from across the world. Earn Fitcoin with every class to level up and unlock prizes. We're bringing the world's best instructors together to deliver you the best workout of your life at anytime that's convenient to you at an affordable price.